OAKVILLE – As one of the western GTA’s fastest-growing and most prestigious family communities, Oakville has developed a reputation for attracting low-rise homes that strike a perfect balance between contemporary design and convenient, family-friendly location. A collaborative project between Menkes Developments and Fernbrook Homes, Millstone on the Park manages to achieve the best of both worlds on a quiet, modern stretch of Dundas Street West in Oakville. 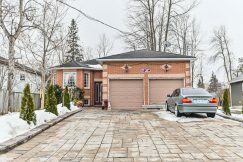 Millstone’s enviable location is just a short distance from several local schools and parks – not to mention easy access to the 403, Queen Elizabeth Way and the Clarkson GO Station. The neighbourhood’s attractiveness, safety and green space all help make it a perfect location for young families. Millstone’s collection of urban towns starts at just $329,990, and offers a selection of two-bedroom layouts ranging in space from 859 to 995 square feet. The largest two models, Lincoln Park and Central Park, offer a truly luxurious experience, with each unit boasting a two-storey layout and spacious rooftop terrace. 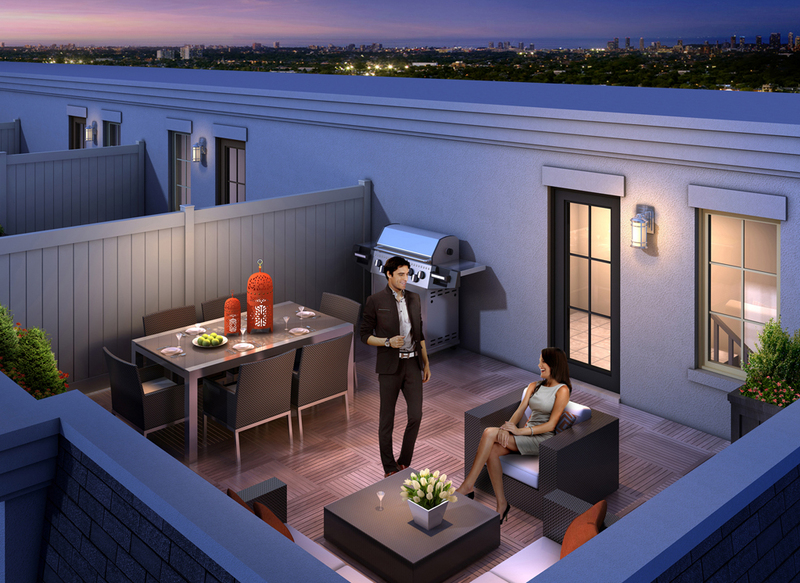 The Hyde Park model’s spacious rooftop terrace. For those looking for the perfect blend of value and elegance, the one-level Hyde Park model (946 square feet) features its own outdoor patio – in a compact two-bedroom design that will be perfectly suited to young families or couples.Another standout model at Millstone on the Park is the 856 sq. ft Stanley Park layout, which features a spacious covered balcony.What really makes this community stand out is its carefully-selected materials, finishes, and design elements. Each home’s exterior elevation is unique and innovative, with textured accents of stucco, stone and genuine clay brick. Inside, homeowners are invited to revel in the elegance of solid oak stair railings, ceramic tile backsplashes, pedestal bathroom sinks, brushed-nickel door hardware, quality natural laminate flooring, and many more tasteful interior finishes. Each townhome was designed with discerning buyers in mind, offering stylish kitchens, serene bathrooms and spacious master suites. As a special bonus, purchasers will also receive 4 kitchen appliances, stackable washer/dryer and central air-conditioning. For a limited time only, buyers will also be treated to a free locker and two years free maintenance – don’t hesitate to take advantage of this special promotional offer*! The models of Millstone’s Urban Towns Collection also offer a range of environmentally-sustainable features that will help owners cut down on their energy bills, such as forced air Hi-Velocity heating systems and high-efficiency boilers. Metal-insulated entry doors with high-quality weather stripping will help prevent air leakage, helping prevent drafts during the winter months. If you would like to get more information about Millstone on the Park, or take a look at floorplans for the project, please do not hesitate to get in touch with your nearest Living Realty branch today.